I have often structured the tasks in my lessons as ‘all/most/some’ to enable simple differentiation but have noticed that this challenges the most able students, instead of all students. It also seems a little unfair that some students have to complete more work to challenge themselves. Instead, I have started using a different way of differentiating lessons to increase the level of challenge. I now structure tasks as ‘challenge/super challenge/super super challenge’. Students choose a task to complete and I encourage them all to take a risk and not just complete the challenge. Most of my students follow this advice but, if they don’t, I have to ensure that every task is a challenge. 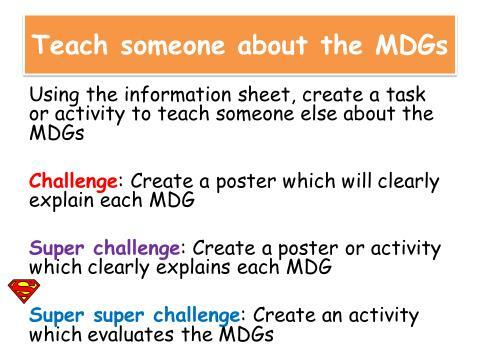 For example, in a recent lesson I asked Year 8 students to create a task or activity to teach someone else about the Millennium Development Goals. To the left is the PowerPoint slide that I show students. I also hand out an information sheet about the goals and their relative successes. Those that chose the ‘super’ or ‘super super’ challenge were able to be more creative and thought more carefully about the goals. Students created word searches with cryptic clues, card sorts, paper fortune tellers and scripts. You can still support students who choose the challenges with differentiated information sheets, something that I would change next time I teach this lesson. I have also used this to structure homework tasks and I have been really impressed with how often students choose one of the more challenging tasks. For example, my Year 9 students have been studying tectonics and as a homework task had to focus on supervolcanoes. 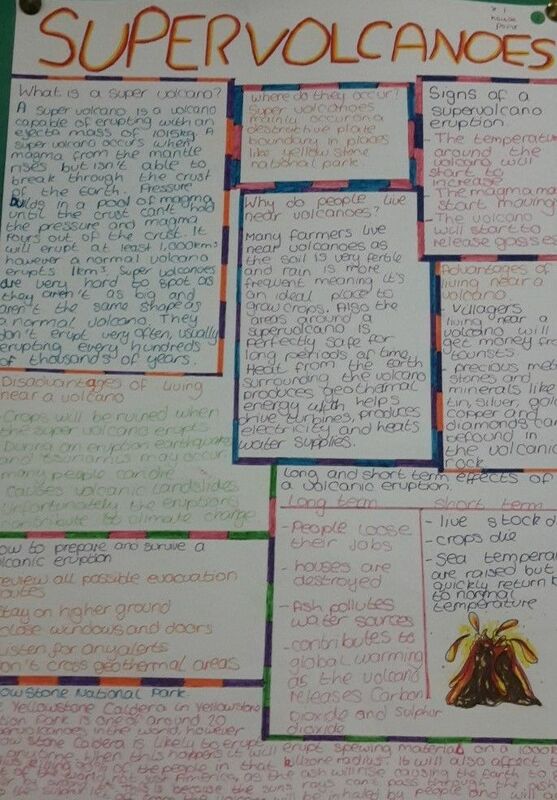 The challenge task was to create a poster warning people about the effects of a supervolcano whereas the ‘super super’ challenge was to create a survival guide in their own choice of format for people living near a supervolcano. To the right is an example of the work created by one of my students but another created a video guide! Perhaps you can try some of these ideas in your lessons or homework tasks and let me know how they go. I’d also love to hear how you introduce challenge into your lessons. Rachel Hawke is Curriculum Leader for Geography at Court Moor School in Hampshire. She completed her PGCE at the University of Oxford, during which time she developed an interest in enquiry learning. Her ideas on this subject have been published in the ‘Teaching Geography’ journal.